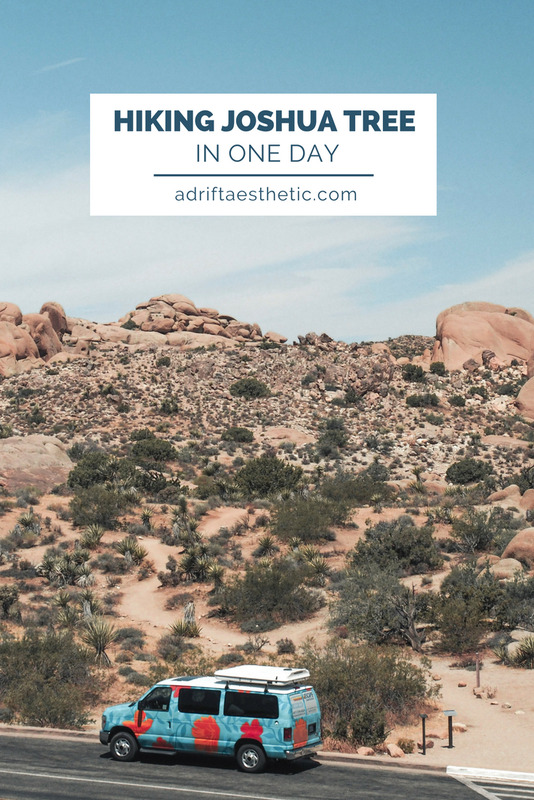 In the middle of California, in an area spanning the size of Rhode Island, you’ll find Joshua Tree National Park, home to surreal landscapes and a zen desert atmosphere. During the day you can hike through seemingly endless rock formations, while at night there are countless stars and planets visible in the panoramic sky (the area officially received a Dark Sky Park designation in 2017). 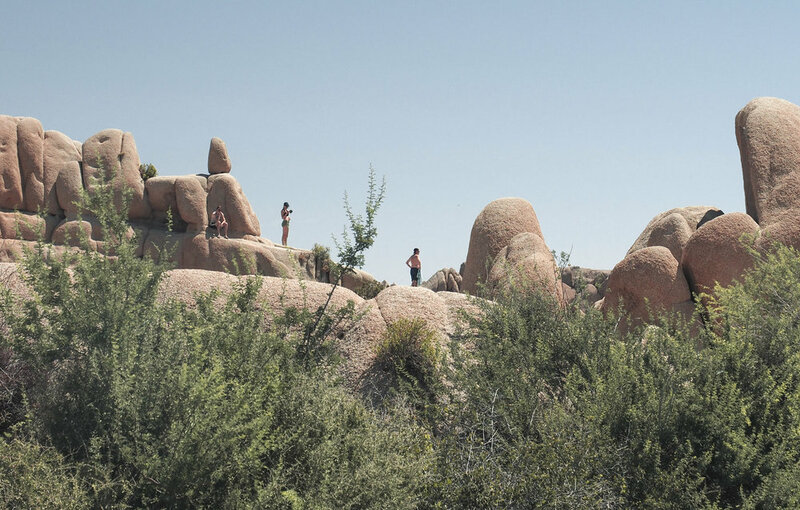 Even in the middle of the summer in 100+ degrees F, Joshua Tree is a perfect Palm Springs day trip. However, we chose to stay a little closer outside of Yucca Valley at the remote Rimrock Ranch cabins so we could get an early start to a day of exploring. Channel your inner Boy Scout or Girl Scout and be prepared with food and at least a gallon of water per person if you plan on hiking Joshua Tree, especially in the summer months. The surroundings of Joshua Tree and the desert can be repetitive and play tricks on the eyes. After a while that one small white rock on the ground starts looking pretty similar to those other four small white rocks on the ground and you can easily get turned around and wander off a trail. National Parks are vast (I’ll say it again: THE SIZE OF RHODE ISLAND) and not always bustling with people like the Grand Canyon so preparation is key. On that note, also check the National Park Service website before you head out. We encountered a “Bee Warning” which sounded more like a poorly rated 80’s horror movie than an actual issue we would have to deal with. Not so much. In the hottest summer months, the bees of the park are desperate for water and they’ll look for any moisture they can find. This means the condensation from your car’s air conditioning system or the sweat on your body. We noticed it the first time we returned from a photo-op to our idle car: about 30 bees flying around our vehicle. I definitely squirmed away from buzzing in my ears a few times while we were hiking but don’t let the warnings scare you. Just realize that you’re venturing into a wilderness environment. We started our trip by driving to the Oasis Visitor center on the east end of the park. This route allowed us to drive along Park Boulevard, the main road, and veer off to other stops and hiking trails until we made it out of the west entrance by the Joshua Tree Visitor Center. We stopped at quite a few of the campgrounds such as Jumbo Rocks, Sheep Pass and Ryan Mountain so we could park our car and trek through the landscape. 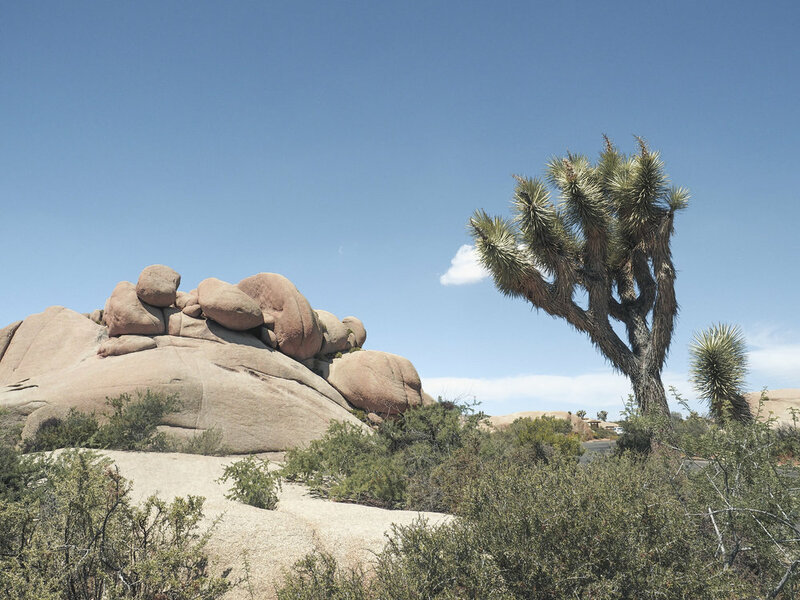 The rock formations and yucca trees are what really distinguish Joshua Tree from other National Parks. The rocks in particular encompass you from all sides, making you feel like you're wandering through Mars. 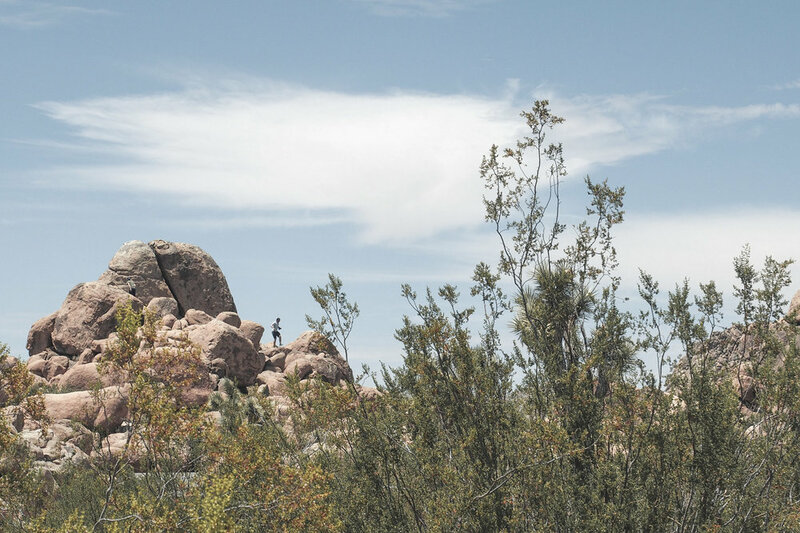 With a lot of the formations perfect for bouldering, Joshua Tree is a rock climber’s paradise. We set off to Barker Dam, a trail that Mike was familiar with from a previous visit. If you can only take one short hike due to heat or time constraints, this is the one. The 1.1 mile loop with take you to a lake in the middle of the desert (although not always filled with water, depending on the time of year). Along the way you pass a lot of the flora and fauna of the park and will get to see all the scenic landscapes the park offers in a condensed trip. Another great hike includes the round trip trek to Lost Horse Mine. With the area being a center for mining during the gold rush, it's pretty cool seeing old abandoned mines from years ago. Pair that with a trip to nearby Pioneertown, and you'll really feel like you've been transported to the Old West. 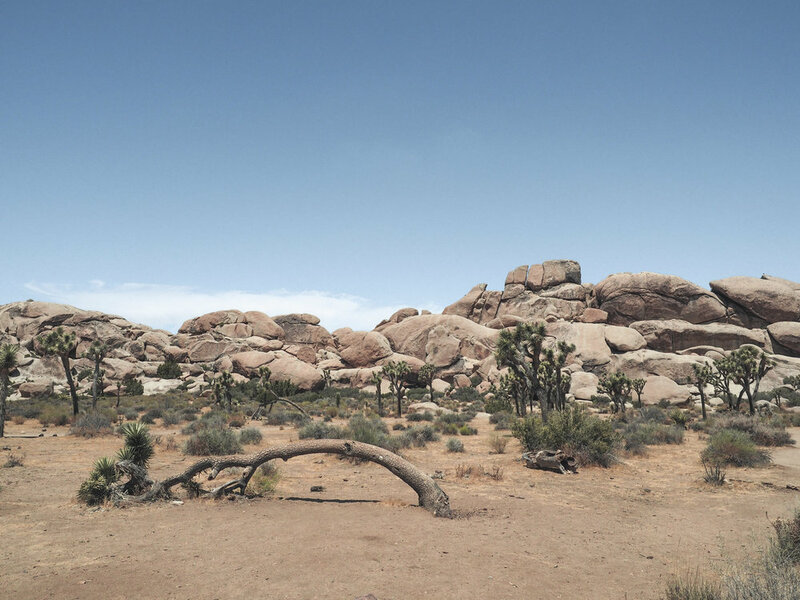 Despite the heat, there’s a quiet peace that can be found in Joshua Tree. Mike can list off quite a few musicians and bands that have come to the park for inspiration or to record. There’s something other-worldly to the landscape and there’s an energy that can be felt when you’re out on the rocks. There aren’t any waterfalls or scenic overlooks like many National Parks, just rugged, desert terrain. Taking photographs in the park is a definite treat. Every turn we met presented a new rock formation slightly different and even more scenic than the previous. Hidden Valley campground and Jumbo Rocks were two of my favorite photography locales. 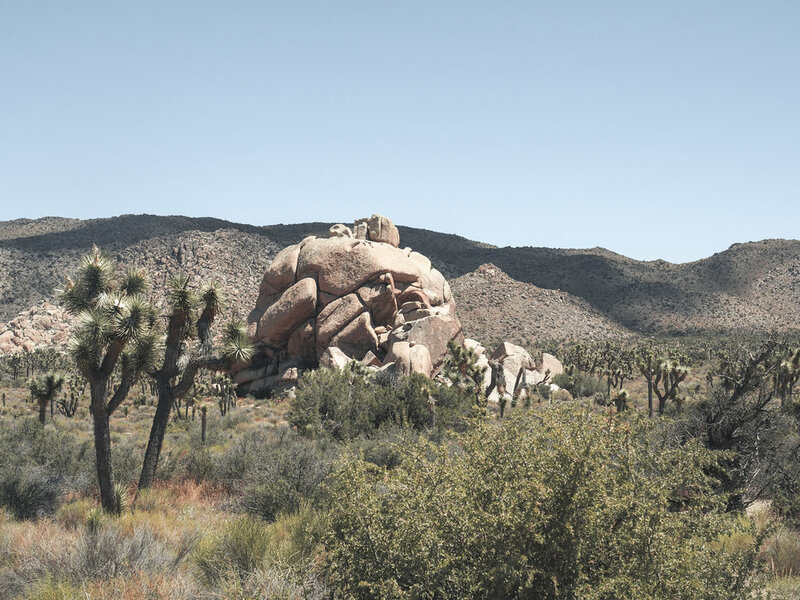 Other stops like Keys View and the Cholla Cactus Garden should also be added to your Joshua Tree itinerary. The backdrop of Joshua Tree National Park may look like something out of a Dr. Seuss book but the vibe is relaxing and tranquil. This is a must for any National Park fan or anyone in the Palm Springs area.